All experience of explore Ninh Hoa. Doc Let Beach, Ninh Van Bay or Nha Phu lagoon in Ninh Hoa town are ideal stops in the coming summer days. Ninh Hoa Town in Khanh Hoa province, south of Nha Trang City, borders Dak Lak province in the west, East Sea in the east. It is considered as the third destination in the tourist map of Khanh Hoa, aside from Nha Trang and Cam Ranh. Doc Let Beach: in Ninh Hai Commune, Ninh Hoa, Doc Let is one of the most beautiful untouched beaches of Khanh Hoa province. About 50km from Nha Trang City to the north, it owns beautiful scenery with hills surrounding beach shores, the shady coconut trees, fine white and flat sand, almost 10 km long. Many services such as surfing, jet skiing, parachute, dragging in the sand and seafood dinner at affordable prices is also provided. Ninh Van Bay: A perfect destination for vacations, honeymoon …, Ninh Van Bay is around 60 km from Nha Trang. Tourists can use speedboat from Nha Trang, take about 20 minutes to get to the bay. Ninh Van is pretty quiet and has natural beauty. Most tourists choose little wooden houses which are surrounded by floral forests and sound of sea waves. Ecotourism Zone Ba Ho: an ideal destination for young people with services of climbing, wading streams, challenging jungle. 25 km from Nha Trang to the north, where there are three natural lakes formed among jungle. The most attractive activities is to go through the forest to explore, in which, each lake has its own natural spectacle with distinct beauty. Nha Phu Lagoon: How to Nha Trang about 15 km, an area of ​​nearly 1,500 hectares, Nha Phu lagoon covers an extensive area with many interesting destinations such as Hon Thi, Hon Lao, Hon Sam, Hon Da Bac, Monkey Island, orchid stream, etc. It meets characteristics of a rare ecological area with mountains, rivers, islands. Hon Lao – Monkey Island is home of thousands of wild monkeys, harmony with nature and people. In Orchid Stream, visitors can kayak, visit Orchid cave, and admire orchids in blossom. Ninh Thuy fishing village: With a casual lifestyle, friendly people are peaceful blue water sea, the fishing village is the ideal destination for you to try as fishermen, struggling with blue ocean waves. Go into small alleys, you will enjoy numerous attractive snacks like noodles, fish vermicelli or delicious apple tea. Other activities are to play traditional games or dive in deep blue sea. Hon Khoi islet: Known for white salt fields which attract a lot of photographers by the idyllic beauty. Here, visitors can witness a day of salt makers in the salt fields. 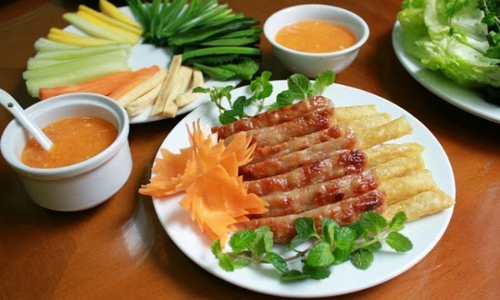 Ninh Hoa grilled roll is one of attractive dishes. Must- taste specialties here are baked rolls, wet rice cake with fish sauce, rice cake soup with shallot leaves, fish noodle soup, etc. Popular drink is coconut fruit. You can buy Ninh Hoa fermented rolls on the routes or fresh and dried seafood in the fishing village.